Many researchers have studied the influence of incubation conditions on embryonic development and hatchability. In most of these studies, machine temperature (MT) was used to control embryonic development. However, internal egg temperature or embryo temperature (ET) may be more relevant to control embryonic development than MT. MT is not necessarily the same as ET. Romijn and Lokhorst (1951, 1956, 1960) measured EST during incubation for eggs incubated at a constant MT of 37.5ºC throughout incubation in still air incubators. In these studies, EST was about 0.1ºC lower than MT during the first 9 days of incubation. After 9 days of incubation, EST rose gradually to 1.3 – 1.5ºC above the MT set point at day 18 of incubation; parallel to the course of heat production (HP). In large scale forced air incubators often step-down MT programs are used to prevent overheating of eggs during the final stages of incubation. 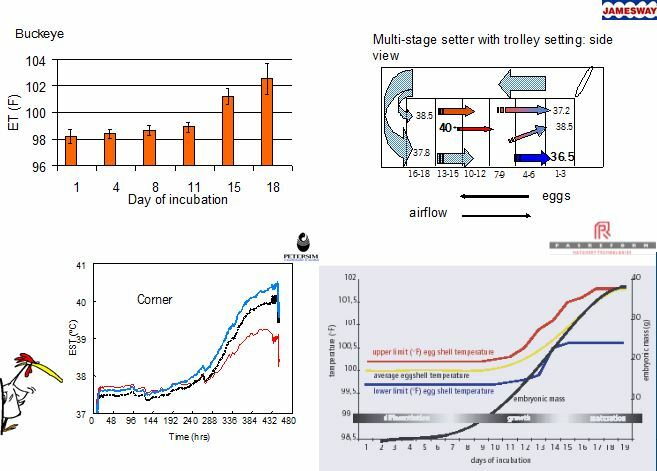 However, EST can vary largely between different places within one incubator with maximum values for EST at day 18 of incubation of over 40ºC (Lourens, 2001; Van Brecht, 2003). Only during a short period of time, ET = MT. According to Briedis and Seagrave (1984) this period occurs at day 9 of incubation where evaporative heat loss equals embryonic HP. The timing of this period depends largely on HP and total heat loss, including air velocity. HP increased with embryonic age, even when EST was kept constant and so the idea that ET and HP need to develop parallel with embryonic age was exchanged for the concept to measure and control ET regardless of HP, where ET is the result of the balance between HP and total heat loss. 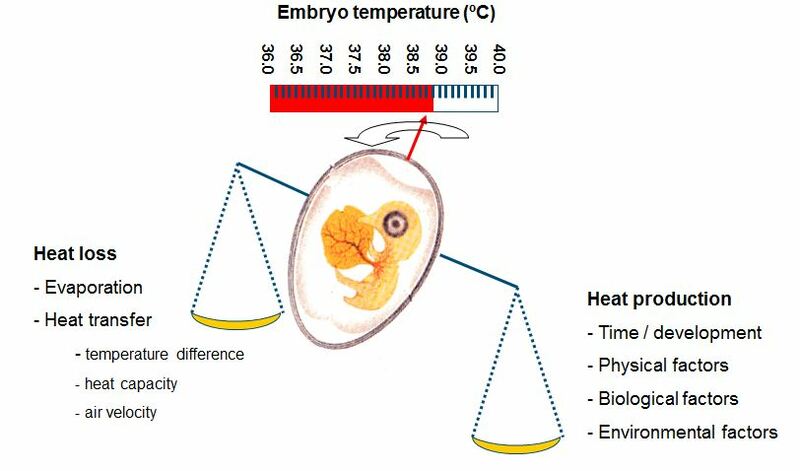 Machine temperature (MT) is a very important factor affecting embryonic development (Romanoff, 1960), hatchability (Deeming and Fergusson, 1991; Wilson, 1991), and post hatch performance (Lundy, 1969; Wilson, 1991). In incubation trials often MT is used as treatment applied to the eggs (French, 1997), but only ET measurements will reveal the temperature experienced by the embryo. Direct ET measurements are destructive and will influence embryonic development and hatchability. 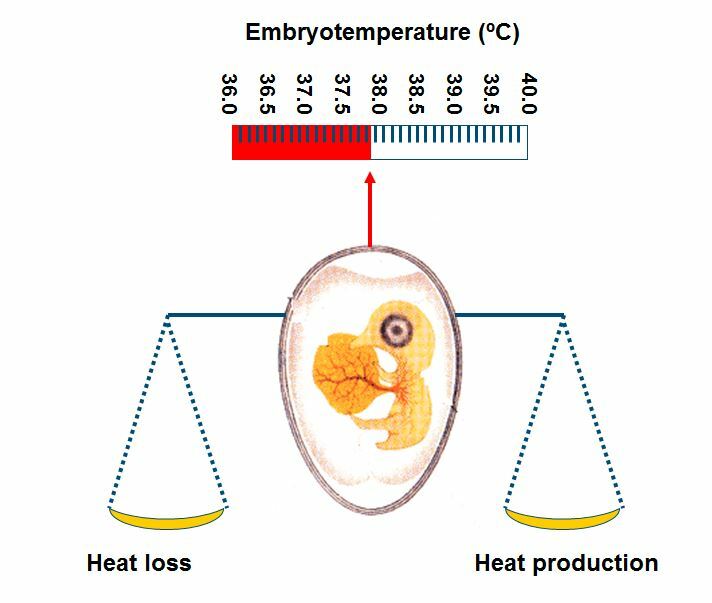 Using eggshell temperatures (EST) as a reflection of embryo temperature can overcome this problem, because EST will not deviate from ET by more than 0.1-0.2ºC (Meijerhof and Van Beek, 1993). Early in incubation, EST will be slightly higher than ET, whereas later in incubation EST will be slightly lower than ET (Meijerhof and Van Beek, 1993). Measurements in a commercial single stage incubator set at a step-down MT program of 38.0ºC at d1 to 37.2ºC at d 18, showed that the overall average EST was close to 37.8ºC (Lourens, 2001). However, depending on the position in the incubator, EST ranged between 36.2 - 37.8ºC at d1, and between 37.8 - 40.2ºC at d18. These large EST fluctuations have a negative effect on hatchability and chick quality (Lourens, 2001), but most probably not too many eggs will be exposed to these extreme values (Van Brecht, 2003). It is therefore more interesting to study the effects of smaller deviations away from a constant EST of 37.8ºC that would occur more frequently. Eggs incubated at low EST during the first week of incubation required a relatively higher MT during the second week of incubation and that effect lasted until hatching. Low MT early in incubation had a negative effect on embryonic growth and post hatch development. Compared to a constant EST of 37.8ºC, the combination of low EST during the first week of incubation and high EST during the final week of incubation decreased hatchability and broiler performance; comparable to findings of Lourens and Van Middelkoop (2000), Joseph et al. (2006), and Hulet et al. (2007). 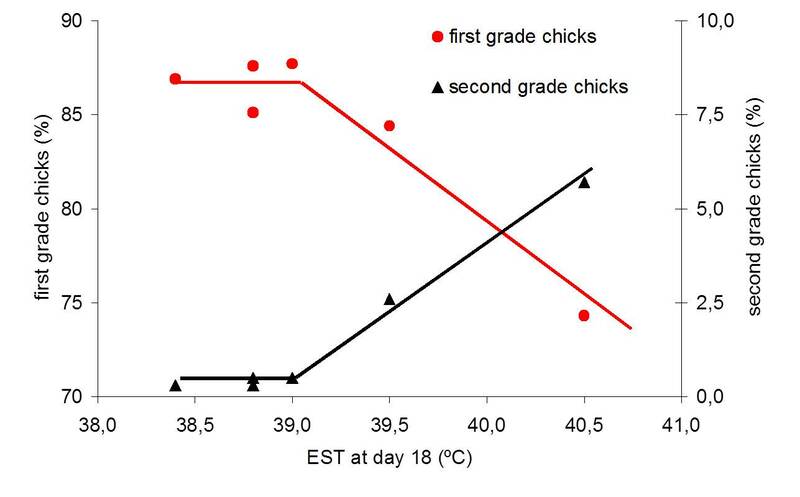 Chicks that hatched from different batches of eggs may require different housing temperatures, and that the EST experienced during incubation can affect the ability of young chicks to maintain sufficiently high body temperatures during cold stress. 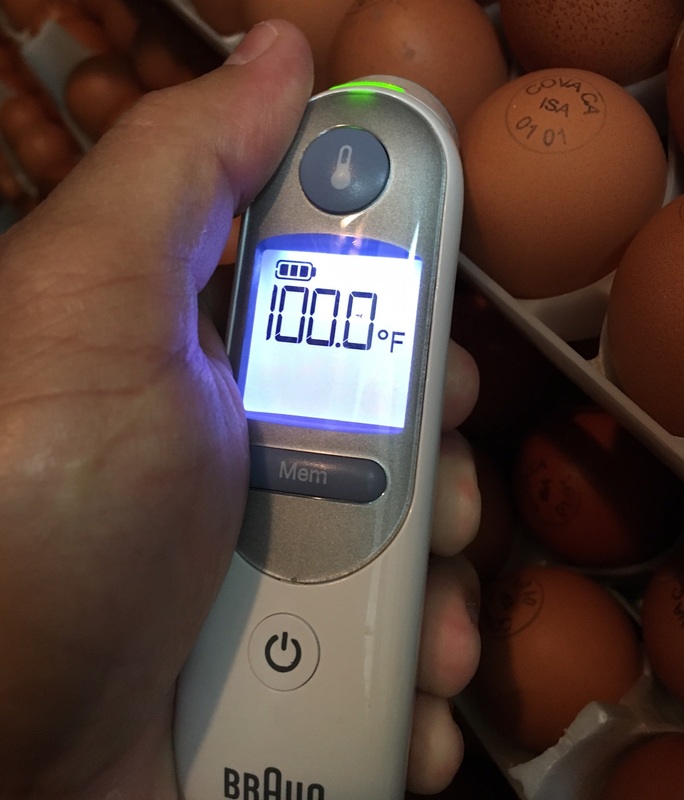 This expresses the importance of controlling EST during incubation, and it suggests that also housing temperatures should be adjusted to conditions during incubation. Minne and Decuypere (1984), Nichelmann et al. (1994) and Tzschentke and Nichelmann (1997) observed that birds incubated at lower MT during the plateau phase were more tolerant to a cold environment after hatching. A possible explanation for this result can be that the eggs incubated at lower MT actually hatched more developed chicks, because the lower MT likely avoided higher ET. This might have resulted in a better thermoregulatory system with a higher metabolism with more HP and consequently a higher body temperature after hatch. As ET is not equal to MT (Meijerhof and Van Beek, 1993) and can vary largely between different positions in an incubator (Lourens, 2001), results of experiments can be influenced by differences in ET that are not reflected in MT, which may lead to a misinterpretation of results. Therefore it is strongly advised to control EST measurements as reflection of ET in any incubation experiment. It can be concluded that relatively small deviations away from a constant EST of 37.8ºC decreased embryonic development, hatchability, post hatch performance and chick temperature, and that negative effects may last until slaughter age. It is therefore of great importance to identify the factors that affect ET. Because ET is the result of the balance between HP and heat loss (Meijerhof and Van Beek, 1993), factors that affect HP and heat loss are discussed in the following paragraphs. HP is determined by 1) the total amount of energy utilized from the egg and 2) the efficiency of this energy utilization (Ar et al., 1987; Pearson et al., 1991). ET changes when HP changes at a constant heat transfer. The age of the embryo in the incubation process is an important factor that determines HP, but also physical, biological and environmental factors affect HP. Embryonic development proceeds with incubation time, and HP increases progressively during the incubation process; also when eggs are incubated at a constant EST. Already after a few days, the embryo starts to produce a noticeable amount of heat. After this initial stage, the weight of the embryo increases almost linearly and HP increases accordingly. HP reaches a plateau when about 70-80% of the incubation period is completed, but embryo weight still increases linearly (Romijn and Lokhorst, 1961; Romanoff, 1967; Dietz et al. 1998). Rahn et al. (1974) suggested that during the plateau phase, metabolic processes are limited by the insufficient exchange of oxygen. It can only be speculated how metabolic processes would run without such limitations, and if embryonic development would be improved when HP during the plateau phase is increased. Under optimal conditions, HP in average sized broiler hatching eggs ranges between 140-150 mW/egg in the plateau phase. When the embryo breaks through the inner shell membranes (internal pipping), it gradually changes from breathing through the chorio-allantois membrane to lung ventilation (Rahn et al., 1979) and increases oxygen uptake and HP. HP increases further when the embryo pips through the eggshell (external pipping). After external pipping, HP can be twice as high as in the plateau phase (Rahn et al., 1979), reaching 250 – 300 mW/egg. When MT during the hatching phase is kept constant, the increased HP leads to higher ET that would gradually match the required temperature of young chicks of 40-41ºC. Physical factors like storage time and egg turning can affect HP during incubation. Long storage time decreased embryonic growth rate, viability, and hatchability, especially in hatching eggs from older breeder flocks (Lapão et al., 1999, Fasenko et al., 2002) and extended the duration of incubation (MacLaury and Insko., 1968, Mather and Laughlin, 1976, Tona et al., 2003). These effects may be the indirect result of lower ET due to lower embryonic growth and hence decreased HP (Haque et al., 1996, Fasenko et al., 2003). Egg turning during incubation is a precondition for normal embryonic development (Tona et al., 2003, 2005). According to Deeming et al. (1987), a critical period between 3 and 7 days of incubation exists, where the absence of turning eggs leads to increased mortality and decreased embryonic growth as a consequence. Due to decreased embryonic development in unturned eggs, HP in unturned eggs is lower than in eggs that are frequently turned (Tazawa, 1980, Pearson et al., 1996). Due to this lower HP in unturned eggs, ET will be lower as well, which will decrease embryonic development even more. Turning will also influence air velocity over the eggs, therefore influencing heat loss which will influence ET especially later in incubation, when HP is increased. The effect of turning during critical periods may therefore be influenced by the additional effect that it has on HP or heat loss and therefore on ET. To examine the effect of turning on embryonic development without confounding effects of ET, the influence of turning should be investigated at a constant ET instead of at a constant MT. Biological factors as egg size, breed and breeder age affect HP during incubation. Large eggs have a higher risk to get overheated than small eggs, due to differences in HP (Rahn et al., 1974; Hoyt, 1987; Vleck et al., 1980; Vleck and Vleck, 1987) and differences in heat loss (Meijerhof and Van Beek, 1993). Due to both differences in HP and heat loss, small and large eggs will reach different ET when incubated at the same MT. Egg size had no effects on embryonic mortality and hatchability when EST was controlled at 37.8ºC. Embryos in small and large eggs incubated both at 37.8ºC EST were equally efficient in energy transfer from egg to embryo; large eggs likely produce more heat than small eggs, because embryos in large eggs utilize more energy. The environment surrounding the hatching eggs influences embryonic development and hatchability (Ognabesan et al., 2007). In general, the embryo consumes oxygen, and produces carbon dioxide, water and heat (Romanoff, 1967). According to Robertson (1923), the speed of the complex process of growth may be determined by the speed of the slowest component. So when transport of oxygen to the embryo, or transport of one of the waste products from the eggshell to the environment is limited, it will decrease embryonic growth, development and HP. Factors that affect gas exchange as eggshell conductance and partial pressure gradient are discussed in Lourens et al (2008). The effects of oxygen concentration, carbon dioxide concentration and relative humidity on HP are discussed below. Adjusting MT avoided high EST during the last week of incubation on embryonic development (Lourens et al., 2005, 2008). It still remained unclear however, whether the constant EST of 37.8°C applied in Lourens et al. (2005) is optimal for embryo development for shorter periods of time and at different stages of incubation. Monitoring embryonic responses as for example vocalizations (Bamelis et al., 2005) or heart rate (Tazawa et al, 1992; Aubert et al., 2000) to external factors during incubation can provide important information about the current status and following incubator settings. It was hypothesized that monitoring other, more direct embryonic metabolic responses as HP or CO2 production, would provide a mechanism to control the incubation process better. It was expected that under optimal conditions, embryonic growth will be higher, hence the consumption of O2 and yolk lipids and the production of waste products as H2O, CO2 and heat will be higher than under sub-optimal conditions (Meijerhof, 2002). This has already been tested in practice by Hulet (2001) and Hulet and Meijerhof (2001), who "maximized" CO2 production in commercial incubators by adjusting MT settings to the CO2 response of embryos between d9 and d18. Hatchability increased by 2 % and it was assumed that optimal embryo development would be found when CO2 production was the highest. Their approach was primarily to increase CO2 production and to avoid overheating, which seem to contradict to the findings by Nichelmann et al. (1998) and Janke et al. (2002) and the results from Lourens et al (2006), where it was observed that embryonic metabolic rate and thus HP increased linearly with increasing incubation temperature. Only when internal egg temperature was increased to over 39.5°C at d 20, the metabolic rate of chick embryos instantly decreased (Janke et al., 2002). Younger embryos were also subjected to short term MT increments from 37.5 to 39.0ºC, but never reached higher ET than 39.5ºC due to their lower HP than older embryos. The determination of metabolic responses to temperature variations or Q10 factors (as described in Nichelmann et al., 1998 or Janke et al., 2002) therefore needs to be standardised in the same ET traject, for example as in procedure described in Lourens et al. (2008). The results presented in Hulet (2001) and Hulet and Meijerhof (2001) were promising, but because CO2 concentration increased with every MT step downwards, it did not become clear how embryonic development and HP would be affected when MT would be temporarily increased as well. Therefore, in Chapter 4, two experiments were carried out. One experiment was carried out under laboratory conditions, the other in commercial incubators in a broiler hatchery. The objective in both experiments was to monitor embryonic metabolic responses to short term EST and MT fluctuations. In the experiments described in Lourens et al. (2006), in the EST range of 1°C below and above 37.8°C, HP was positively and linearly related with EST, similarly as described in Janke et al. (2002). Within the studied EST zone, no maximum in HP was observed. Also in the hatchery experiment, when CO2 responses were evaluated during 1 hr after a MT change, CO2 production was linearly increased when MT was increased and CO2 production was linearly decreased when MT was decreased. When the MT would be set according to increases in CO2 production, EST would increase far above 37.8°C, reaching over 39ºC, leading to an increased percentage of overheated embryos. These findings are in contrast to the findings of Hulet (2001) and Hulet and Meijerhof (2001). The results described in Hulet (2001) and Hulet and Meijerhof (2001) can probably be explained when their technique saved eggs from severe overheating, as it was shown by Janke et al. (2002) that HP decreases when ET reaches over 39.5ºC; avoiding eggs from severe overheating may therefore increase HP. Still, this explanation is not likely, since hatchability in both incubators were acceptable. Another explanation can originate from differences in ventilation rates between experimental and control incubator. After each temperature step, ventilation was adjusted to level CO2 concentrations in both the experimental and control incubator. A temporal undershoot of the CO2 concentration or temporal increase in O2 concentration may have temporarily increased HP in the experimental incubator and hence may have affected the decision for the direction of the next temperature setting. The fact that HP increased with higher EST does not automatically imply that embryonic growth is also increased. It appeared that HP was highest for the combination of high EST of 38.9ºC with high oxygen concentration of 25%. However, no interaction between EST and oxygen concentration for embryonic growth was observed, showing that HP but not embryonic growth can increase in overheated eggs when oxygen is sufficiently available. It was concluded that it will be difficult to use embryonic metabolic responses to short term EST fluctuations as a tool to control the incubation process. It has been shown that HP can be increased by higher oxygen concentration (Lokhorst and Romijn, 1965, Bjønnes et al., 1987, Van Golde et al., 1998), and be decreased by lower air pressures (Lokhorst and Romijn, 1965, Hassanzadeh et al., 2004). Next to oxygen concentration and air pressure, also other factors can affect the transport of oxygen through the eggshell to influence HP indirectly. For example, egg size and the quality of the eggshell may play an important role in gas exchange. Large eggs have a relatively smaller ratio between egg surface area and egg volume and face therefore more difficulties to acquire sufficient oxygen. This may be compensated by the decreased eggshell quality of eggs produced by older hens (Roland, 1976; Britton, 1977; Tullett and Board, 1977; Peebles and Brake, 1987), because eggs with poorer shell quality increase the eggshell oxygen conductance compared to eggs with good shell quality (Christensen et al., 1996). A constant higher MT initially accelerated embryonic growth and utilization of nutrients and energy from yolk and albumen, but decreased embryonic growth later in development (Romanoff, 1972). The fact that embryonic growth can be accelerated when oxygen availability was increased suggests that oxygen was a limiting factor (Rahn et al., 1974; Metcalfe et al., 1981). Limited oxygen availability may therefore explain the plateau phase for gas exchange to at least some extent and hence influence the maximum value for yolk utilisation and HP. The direct effects of CO2 concentration on HP are unknown, but there is evidence that some indirect effects may exist. Onagbesan et al. (2007) for example, reviewed effects of elevated CO2 levels on embryonic development and extra embryonic membranes. High CO2 levels early or late in incubation seem to stimulate early hatching (Visschedijk, 1968; Buys et al., 1998; Hassanzadeh et al., 2002). High CO2 levels are often achieved by reducing the ventilation, which increases not only CO2 levels, but also humidity and ET. Therefore, it can be questioned whether early hatching is the effect of increased CO2, increased relative humidity or increased ET. Oxygen availability to the embryo at high CO2 concentrations is further affected by factors as blood oxygen capacity, haemoglobin and haemoglobin affinity for oxygen, that increase with development in association with an increase in erythrocyte count and hematocrit value (Tazawa, 1980). The role of CO2 in incubation remains poorly understood. When O2 availability to the embryo is reduced due to increased CO2 levels in the incubator, the question rises to what extent HP and embryonic development are limited by “apparently normal” CO2 concentrations of between 0.3-0.5% used in practice or during incubation experiments. It can be expected that during the second half of incubation, HP may increase and embryonic development may improve when eggs are incubated at lower CO2 levels. This remains an interesting area for further research. Direct effects of egg weight loss during incubation on HP are unknown, but some indirect effects may exist. Weight loss during incubation is affected by the water vapour pressure deficit between egg and environment and is influenced by the shell conductance (Meijerhof and Van Beek, 1993). It has been suggested that for maximal hatchability, weight loss until pipping should range between 12-14% (Meir at al., 1984; Hulet et al., 1987). Embryos during the first week of incubation are more susceptible for high weight loss and osmotic changes than embryos during the last week of incubation (Snyder and Birchard, 1982; Ar, 1991). In general, sufficient weight loss is considered to be a prerequisite to form the air cell, to provide the embryo air after internal pipping (Rahn et al, 1979). Low weight loss may be associated with a limited respiratory gas exchange, and low shell porosity have been shown to limit oxygen consumption (Tullett and Deeming, 1982; Burton and Tullet, 1983). Weight loss coincides with evaporative heat loss (see the next paragraph), and relative humidity affects heat transfer and hence ET as well (Chapter 6). It can be concluded that several factors have direct or indirect influence on HP. To understand the relationships between HP and ET, the factors that influence heat loss need to be addressed as well. Heat transfer is mainly determined by the temperature difference between egg and environment and air velocity across the egg, and to a lesser degree by air humidity and evaporative heat loss (Kashkin, 1961, Meijerhof and Van Beek, 1993; Van Brecht et al., 2005). 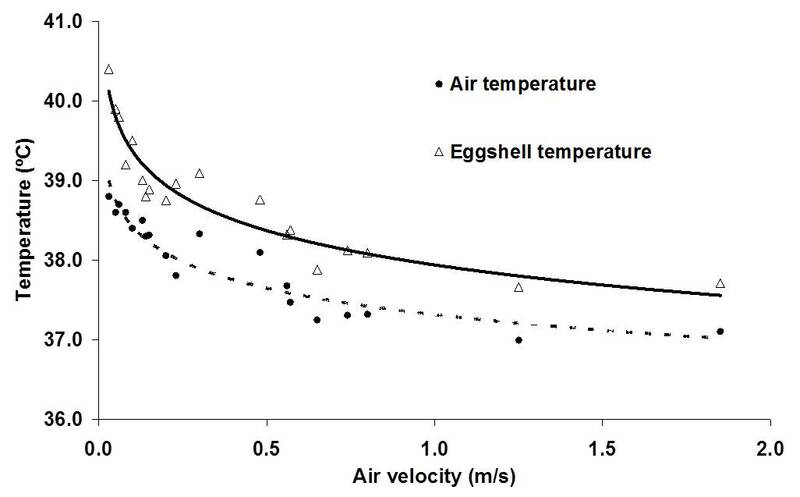 Air velocity across the eggs in commercial incubators can range between 0 and 2 m/s, depending on the position of the eggs within the incubator (Lourens, 2001, Van Brecht et al., 2003). The effect of air velocity on ET at different levels of HP is calculated in Lourens et al (2009), and fit well with the observations done by Lourens (2001). Relative humidity however in combination with temperature influence the water vapour pressure gradient between egg and environment. Depending on the water vapor pressure gradient between egg and environment and the conductance, a hatching egg loses a certain amount of its initial weight during incubation. High relative humidity of the air surrounding the eggs decrease the water pressure deficit, which decreases egg weight loss. Latent heat loss is low when egg weight loss is low (Meijerhof and Van Beek, 1993). Evaporative heat loss can cool down the eggs to a large extent. When for example 10,000 eggs of 60 g loose 0.6% of their initial weight per day, they produce 150 ml of water per hour. The evaporative heat loss will decrease the average ET by 0.2ºC (Meijerhof and Van Beek, 1993). Because all eggs lose more or less the same amount of water uniform across all positions in the incubator, in theory all eggs experience the same cooling effect. Humidifying discs or spraying nozzles deliver water more locally, and can have a larger, more local evaporative cooling effect. When for example humidifying discs or sprayers bring in 150 ml of water in the air per hour and reach only 10% of the eggs near the humidifiers, locally eggs can cool down as much as 2.0ºC. Ventilation brings in air of low temperature that decreases relative humidity inside the incubator, so humidifiers are often used when ventilation is applied to remove excess of CO2. There are only a few studies, where heat loss was adjusted for changes in HP in order to control ET. Apart from this thesis, only in studies by Lourens and Van Middelkoop (2000), Joseph et al. (2006), Hulet et al. (2007) and Leksrisompong et al. (2007), ET was controlled by adjusting MT. At this moment, there are no studies known where heat loss was adjusted by changing evaporation, air velocity or humidity. When during experiments factors are studied that affect heat loss, the effect on ET should be taken in consideration. If changes in HP are not balanced by changes in heat loss, ET will change. The most obvious factor that should be taken into consideration in incubation experiments is the time dependent HP. If changes in HP in time are not taken into consideration, and eggs are incubated at a constant MT, eggs have the risk of getting overheated, especially in situations of low air velocity (Chapter 6). The effects of low EST during the final week of incubation were not examined in this thesis, but the effect of 1ºC below 37.8ºC may be more harmful for embryonic development and hatchability than the effect of 1ºC above 37.8ºC. Especially in large commercial incubators, it will be more difficult to maintain uniform ET throughout the incubator than in small scale experimental incubators due to differences in heat transfer at different locations. Also, the optimum average EST for highest hatchability in large incubators may be different than the constant EST of 37.8ºC as applied in our experiments. Low EST will delay hatching time, and to prevent low EST it may be of practical use to have a higher average EST during the last week of the incubation process. 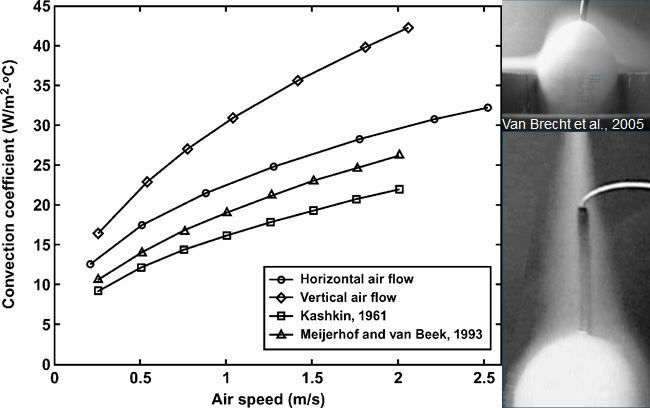 Using the mathematical model described in Meijerhof and Van Beek (1993), the effect of HP on ET was calculated for different air velocities. It can be seen from Figure 1 that at a constant MT and constant RH of 55%, ET can increase significantly, depending mainly on air velocity. 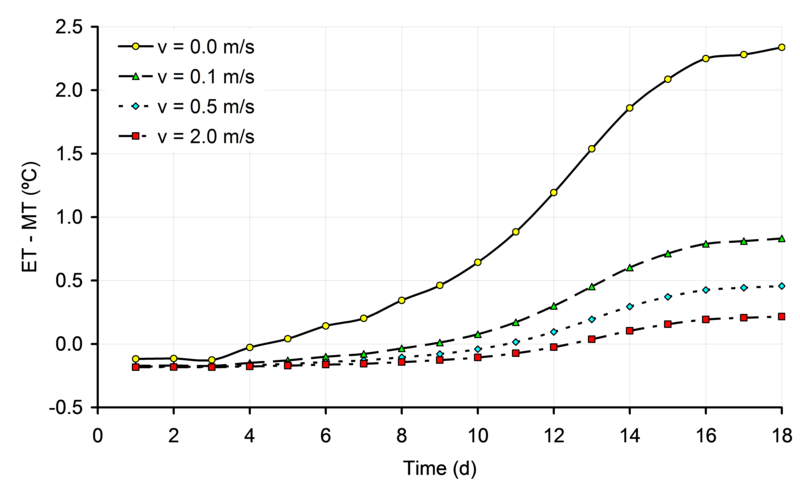 It can also be seen in Figure 1 that the timing of the moment where ET = MT depends largely on air velocity. In still air, ET = MT at d4, whereas when air velocity is 2.0 m/s, ET = MT at d12. The effects on ET in practice may be even greater, when the temperature of the air surrounding the eggs also increased by high ET (Chapter 6). Also the efficiency of energy transfer between egg and embryo is decreased in eggs incubated at higher ET, resulting in a even higher HP and ET (Chapter 6). The effect of increased HP on ET was calculated in Chapter 6. Because air velocity has a major effect on heat transfer, the results were calculated for different air velocities ranging between 0.0 and 2.0 m/s. For each 10% increase in HP above 150 mW/egg, ET increased 0.27, 0.11, 0.06 and 0.05ºC for eggs incubated at 0.0, 0.1, 0.5 and 2.0 m/s, respectively. Especially at low air velocities, changes in HP will affect ET. Because air temperature will also increase more at places with low air velocities, which increases HP even more, ET can increase quickly above acceptable limits for optimum development (Chapter 6). Figure 1. Development of ET during incubation, for eggs of 62g with a HP of 150 mW/egg, incubated at a constant MT and at air velocities of 0.0, 0.1, 0.5 and 2.0 m/s (based on calculations explained in Chapter 6). During incubation, HP increased with embryonic age, even when ET was kept constant. The idea that ET and HP need to develop parallel with embryonic age need to be exchanged for the concept to control ET regardless of HP. To measure and control ET without disturbing the incubation conditions and embryonic development, EST measurements can be used as a reflection of ET. Embryos appear to be very sensitive for deviations away from a constant EST of 37.8ºC, and react with either decreased embryonic development or with instant metabolic changes to temperature fluctuations. Within the EST zone between 36.8 and 38.8ºC, HP increases linearly with EST. However, when EST is increased above 37.8ºC, the efficiency of energy utilization decreased and embryonic development decreased as well. ET is determined by the balance between HP and heat loss. Many factors affect HP and heat loss, and to study factors that affect either HP or heat loss, ET should be controlled to avoid compromising effects of ET on embryonic development and hatchability. Best embryonic development occurred in eggs incubated at a constant EST of 37.8ºC until day 18 of incubation, but it is unknown whether this constant EST of 37.8ºC is optimal for all batches of eggs. Also, the optimum average ET in a large incubator may depend on the uniformity of ET. So ET is of great importance for embryonic development, but when ET is controlled, other factors become increasingly important. Embryonic development may be improved by any measure that increases gas exchange, energy utilization and HP, under the precondition that ET remains unaffected. This will be an interesting area for further incubation research. below: some figures showing EST variations in different types of incubators. Note: all incubators have EST variations, but some more than others.